I’ve spent rediculous amounts of time reading about different chicken breeds. In the end, I decided I wanted some good dual-purpose hens to provide eggs and meat. 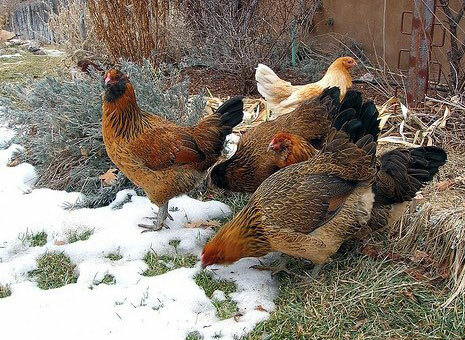 I need chickens that can handle cold winter weather and heat. Of course, both heat and cold can be overcome artificially, but it’s nice to start with a breed that does well. I also wanted hens that have some visiual interest. I am still debating if I want a rooster for now. The two concerns are 1) allowing my little girl to gather eggs without fear of an ornery rooster, 2) keeping the eggs true to their breed so they are more appealing to egg customers. I will probably determine which eggs sell the best and focus on that breed going forward. 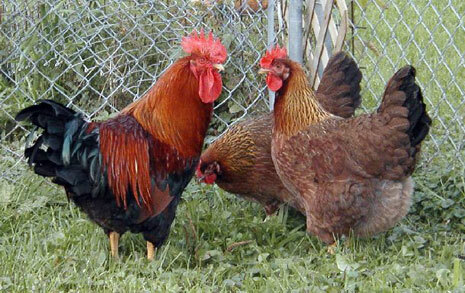 I want docile breeds that produce well and have various egg colors. I want them big enough that one bird could feed my family. After reading and searching and reading and searching, I came up with these breeds to start my flock. 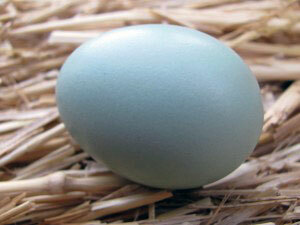 Ameraucanas are very good layers of blue and green eggs. They come in a variety of colors and weigh about 5.5 lbs. They are well adapted to both free range or confinement, although I’ve seen them act more aggresively to other birds when confined. Ameraucanas are very cold hardy with pea combs that help withstand winters chill. Ameraucanas lay 5-6 medium to large eggs per week. The shades of blue and green vary between hens. Australorps are a large breed developed from Orpingtons in Australia. They are dual-purpose birds that weigh in around 6.5 lbs. 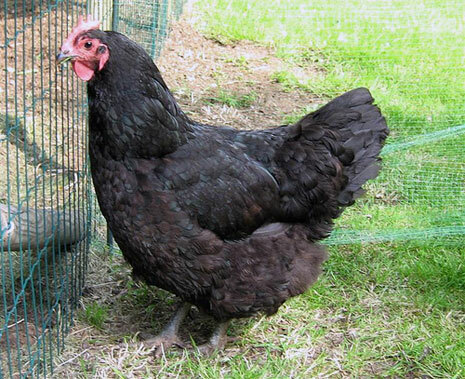 Australorps ar well adapted the confinement or free range, calm, docile and easily handled. They make great mothers. Australorps will lay 5-6 average-sized, brown eggs per week. Delaware is a large, American breed weighing in around 6.5 lbs. They are dual-purpose and both heat and cold hardy. 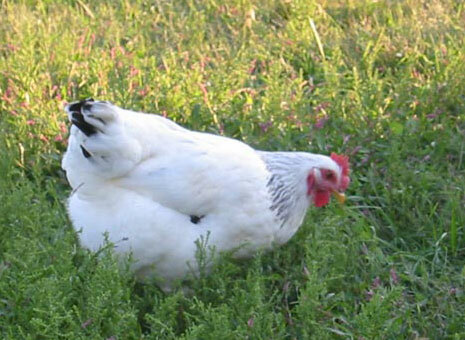 Delawares are well adapted to confinement or free range, they are calm and docile. 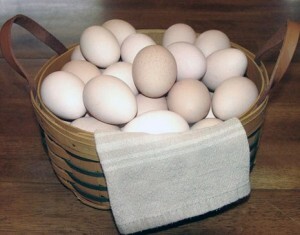 Delaware’s produce very large medium to rich brown eggs. They produce 5-6 eggs per week. They also lay well in the winter months. Faverolles are a french breed developed in Normandy. They are a very large breed at 7.5 lbs. They do well in confinement, but may be bullied by other breeds. Free range allows more room to roam and will help alleviate bullying. Faverolles lay beautiful creamy colored eggs. They lay 5-6 eggs per week and do very well in the winter. Orpingtons are the largest of this bunch, coming in at 8 lbs. 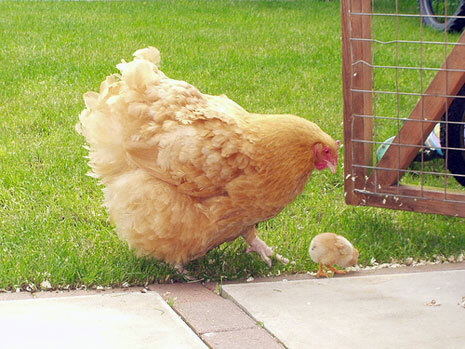 Orpingtons are brooders and very good mothers. While they aren’t the best layers, they produce steadily through the winter. They are great meat birds that mature moderately early. Orpingtons are very adaptable to confinement and do well as free range birds. They are docile and easily handled. 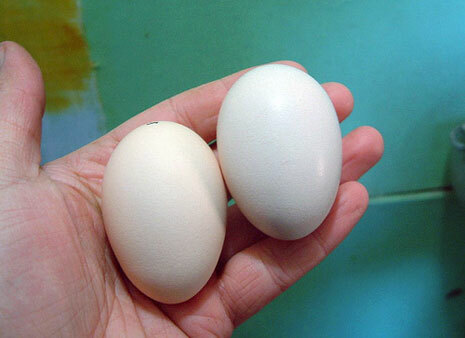 Orpington eggs are a brown color of above average size. They produce 4-5 eggs per week, but they produce consistently year-round. 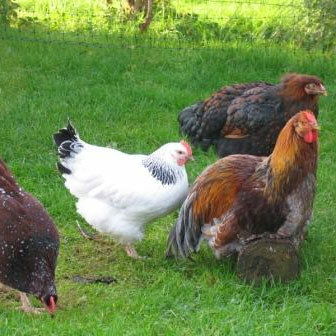 Sussex chickens come in a variety of colors. I like the white, but they also come in shades of brown, red and speckled. They average about 7 lbs and they are very cold hardy. They do well in confinement or free range. Sussex are the most lively of this bunch, but are more docile than flighty. 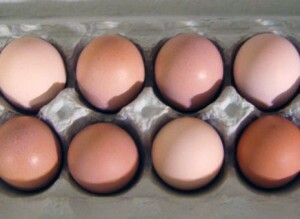 Sussex eggs are creamy to light brown. They produce 5-6 eggs per week and do well in the winter. Welsummers claim to fame is the Kellogs rooster. They are the smallest in this group at an average size of 6 lbs. Welsummers are active birds but tend to be more docile than flighty. 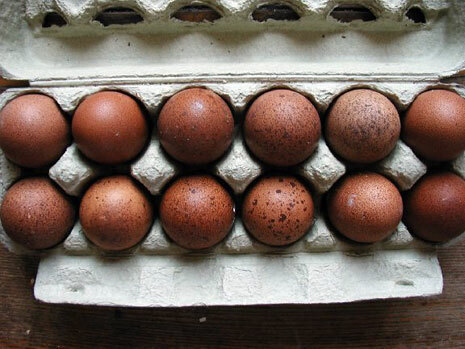 Welsummer eggs are a rich, dark, terra-cotta brown with speckles. They produce 4-5 eggs per week but slow down in winter. I chose these birds specifically for their eggs. 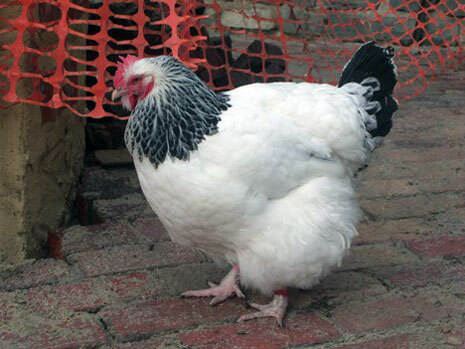 Wyandottes are very cold hardy chickens and weigh around 6.5 lbs. They are docile and do well in confinement or free range. 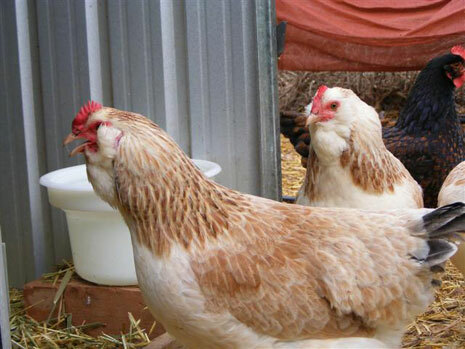 The pics above are of a gold-laced Wyandotte (left) and a silver-laced Wyandotte (right). They are rarely broody, but make excellent mothers. Wyandotes are very cold hardy. Wyandotte eggs are light to rich brown. 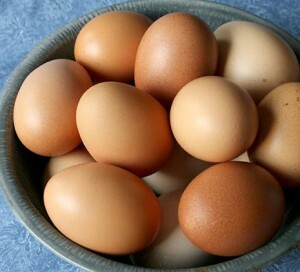 They are average layers at about 4-5 eggs per week. They are solid winter layers though. So, that’s my flock. Well, they will be. As soon as we get moved in, I will be hunting down chicks. This is a bad time of year to find them, but they will be mature and ready to start laying by spring. 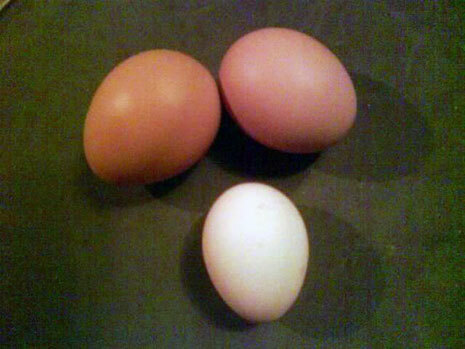 As you can see, I have a mix of bird sizes and egg sizes. Some are better for meat and others better for eggs. I don’t know who is more excited for the first egg, me or Kelcea. I’ll let her have it, there will be plenty.